Not a very exciting pattern for you guys... but I wanted to try another "embossed" pattern. 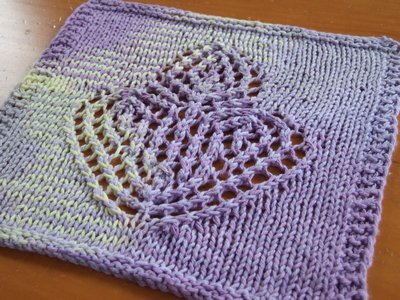 Although this pattern is nowhere as interesting as my 4 Embossed Hearts cloth, Embossed Turtle cloth, or Ursine cloth, it is pretty quick & easy to knit up. 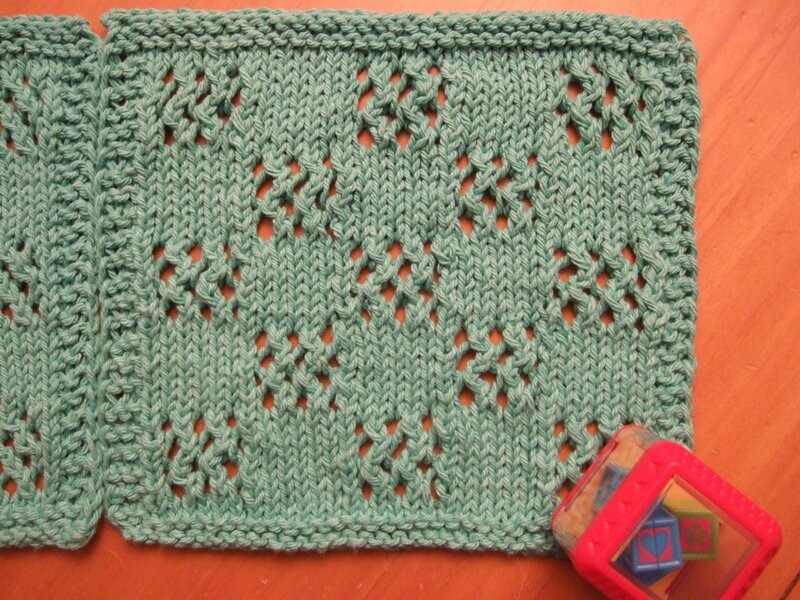 The pattern is comes from BW4 pg 206. 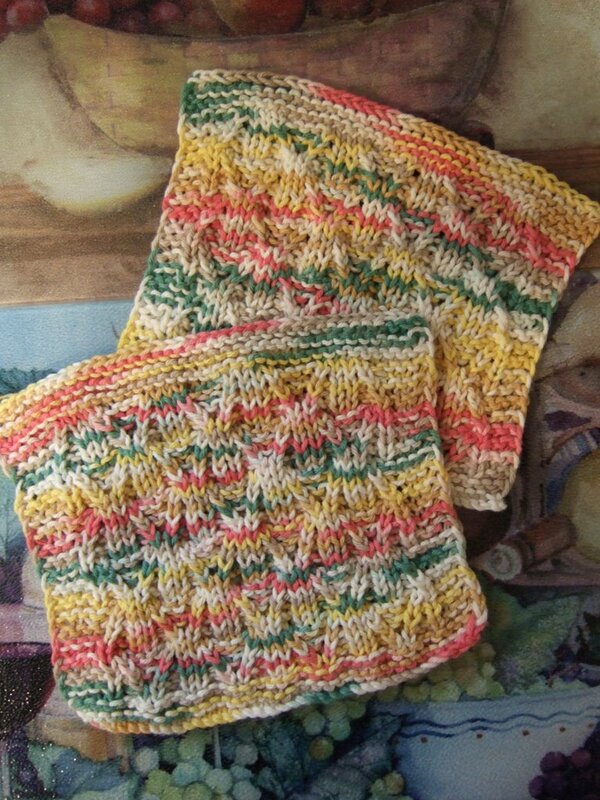 I still feel as if all my dishcloth cotton yarns are the same old selection of colors. 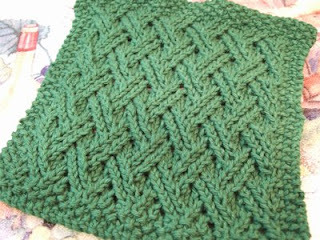 But I did dive deep into my cotton stash and fish out this one, P&C baby green, which is an even lighter shade of green than the light green cloth you see here. I'm starting to appreciate the lighter shades and wonder why I ever bought so many dark shades. 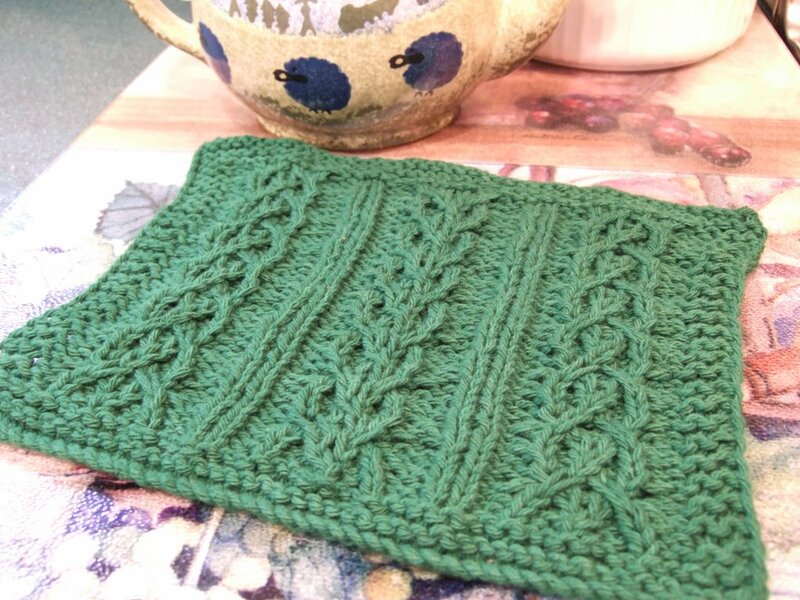 You can see that this cloth wasn't knitted with even tension (I think I knit tighter when I'm in the car and looser when I'm at home) but the photo above gives you an idea of what the cloth will look like. 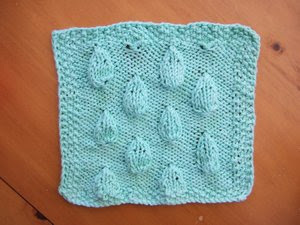 Teardrops Cloth pattern can be downloaded from Smariek Knits Yahoo Group. Oopsie. I've just discovered this draft post from way back in 2006 which I never posted! Oh well, better late than never, right? 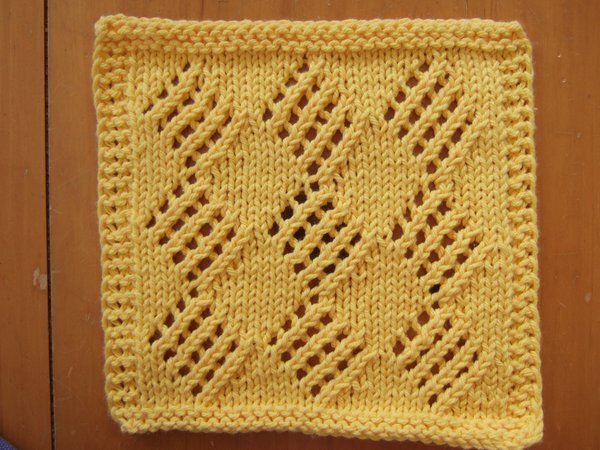 It's the Double Lattice pattern from BW2 pg 152. 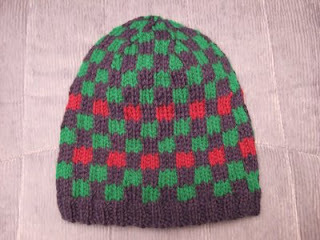 Yes, it's one of the more boring patterns, since it is one of my earlier works. But I do promise something more interesting soon (not referring to the Teardrops Cloth, which I have ready to post). 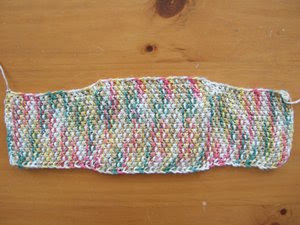 This cloth is about 6.75" W by 8.75" H.
Not sure what results I expected, but I guess this would partly explain why I have little time for knitting? 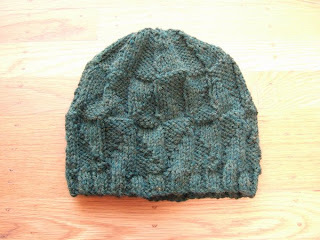 And it doesn't help that I just got on to Ravelry. 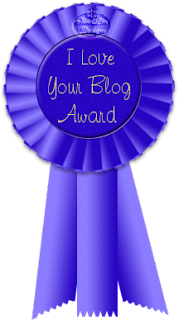 66%How Addicted to Blogging Are You? I thought I'd share one of my favorite Francis Cabrel songs, Encore et Encore. This is a live acoustic version. A little add-on for Mozilla Firefox to download (YouTube, etc) videos. 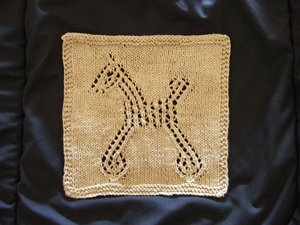 I received an invite to Ravelry last week (only just noticed it tonight). No clue how I got invited. I never submitted my name. So I can only assume that someone else did this. Had no idea what it was about, so I checked it out. 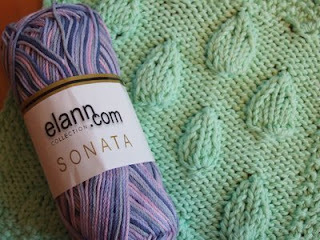 Looks like a neato mosquito knitting project/pattern/stash/anythingyoucanthinkof organizing site. I need to explore the site further when I have more time. Little M had her first big bop on the head today. 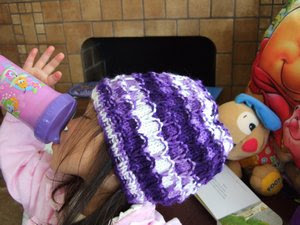 She was walking in the living room, lost her balance and hit her head on the coffee table. The nastiest bruise showed up immediately to the right of her left eye. DH was with her in the living room when this happened and he said it looked painful. Thank goodness I didn't actually see this happen. But I heard her wail from the other side of the house. We're surprised that she hasn't bopped her head this hard until now, over a year after she started walking. We were so sure it would have happened much earlier. Anyhowz, I just realized that I had no ice packs in the freezer. So to improvise, I put some frozen peas and put them into a zip lock bag. That seemed to work a bit after we distracted M with some string cheese, cuz she wanted to eat the peas. And we made a little game of having her hold the peas against the bruise while she counted to 10 or said her ABCs. We were asked where we wanted the controls for the blinds... which side for the Lifting and which side for Tilting. DH couldn't care less which side they went on. I had no idea which way people choose for these things, but I decided that I would probably use Tilt more often than Lift. Assuming this, I chose the Tilt controls to be closest to me as I walk towards the window/room. It seemed logical to me. However it might be the opposite of what most people choose. I dunno. We went with a Wand to tilt the vertical blinds. DH prefered the pull strings for the horizontal blinds. I had a slight preference for the Wand, partly due to having little M running loose in the house. We chose the pull strings after the sales person told us that the cords snapped apart easily at the bottom. Anyhowz, if it looks like a problem, I think I'll just find a way to tie up the cord at the top where it is out of reach. I don't really see us lifting the blinds all that much anyways. We have horizontal blinds in our living room right now and I can't remember the last time I ever lifted them; we always tilt them to let in light. We've been trying to install an OS on an old Toshiba Tecra 8000. One would normally think of this as a basic task. However this particular laptop has no CD ROM drive (don't know what happened to it), but it does have a floppy drive. Most OS installers are no longer available for floppy drives. So we went for Debian 4.0 which could be installed over the network. Well that went OK! Yay! So given than we managed to install Debian over the network, this means that the network card (in this case, a PCMCIA card & dongle) is functional. Fast forward a little bit to the reboot after the Debian install, and we discover that we no longer have network/internet access. Don't know what happened. Tried MANY different things, no luck. It's such an odd problem. Gotta love computers. They should just work!!! Hmm... maybe a different Linux distribution will solve the problem? I suppose there's RedHat Linux 6.2, which is state of the art (circa 1999, lol). Sigh... if only we had a CDROM drive for this laptop. Thank goodness this is not my computer. :-) Although I've got most things working on my pre-owned IBM Thinkpad, I just have some straggler applications to install. And some minor data I need to punt over from the old laptop because I forget them the first time around. There's actually a story behind where the computer software boxes are located and why they're not easily accessible. I used to know exactly where they were... in the garage, right in front with no other boxes on top of them. But then we had an unexpected water heater leak back in March so I had to move ALL our boxes PDQ while I distracted M with The Wiggles. Mom was at home so she helped mop while I moved the boxes. Thank goodness nothing got really wet in the process. So now the boxes are in one of two other rooms downstairs, in no particular order. It's a mess. But I'm sure it will get sorted out as we move stuff to the new house. ;-) We shut off the water main, which helped slow down the leakage. Anyhows, we called a Big Water Heater Company to replace the water heater. BWHC came by to look at the problem. 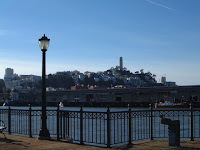 Due to new San Francisco codes, the new water heater needed to be elevated 16" with a bollard installed in front. As a result, a regular height water heater would not fit in the space. They would need to install a "shorty" model. Unfortunately, our WH Guy only carries one in his truck and he already used it earlier in the day. (Our WH leaked after 4PM, we didn't get a guy to come by until 6PM or later) So WH Guy said he would return the next morning. He turned off the hot water valve. In our "panic" mode, we never thought to do that. So we were able to turn on the water to the house and have cold water for the night. Cold water is better than no water. WH Guy came back the next morning to install the new WH. Yay!!! I mean, "slow" is not unheard of. Here's a photo of a bill I received from California Pacific Medical Center for something related to M's birth in March 2005 ... bill received 2 YEARS after she was born. 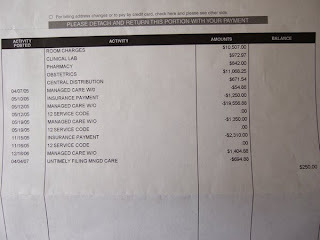 All my medical bills are vague, it's hard to figure out what is what. But this is apparently a bill for the remaining $250 balance after all the dust has settled. 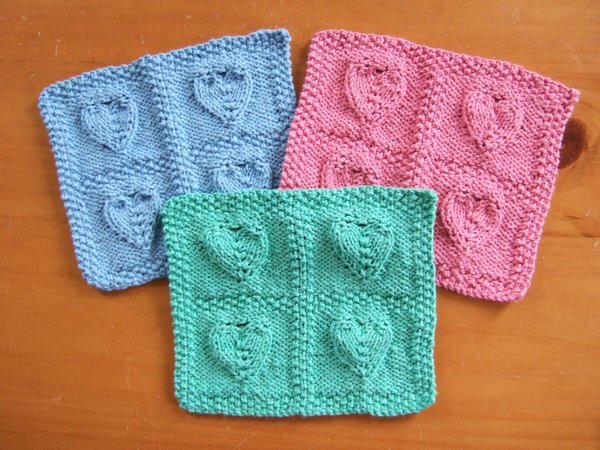 But that's not to say that I haven't done any knitting lately. 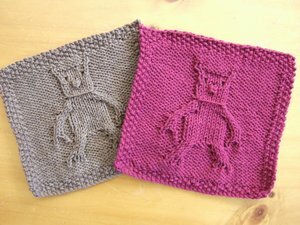 I've done just enough knitting and/or typing lately that my wrists actually hurt!!! Very logical, you tend to analyze everything going on in your life. 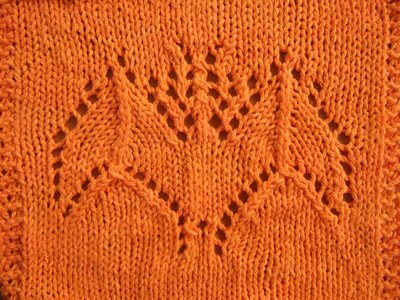 I still haven't figured out how I'll turn the Highland Wool into a vest for my mom. 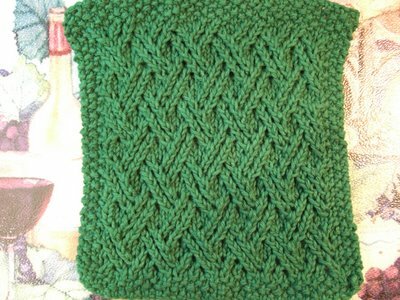 The problem is that the Lion Brand Cotton yarn for the vest pattern is a bit thicker than the Highland Wool I want to use. 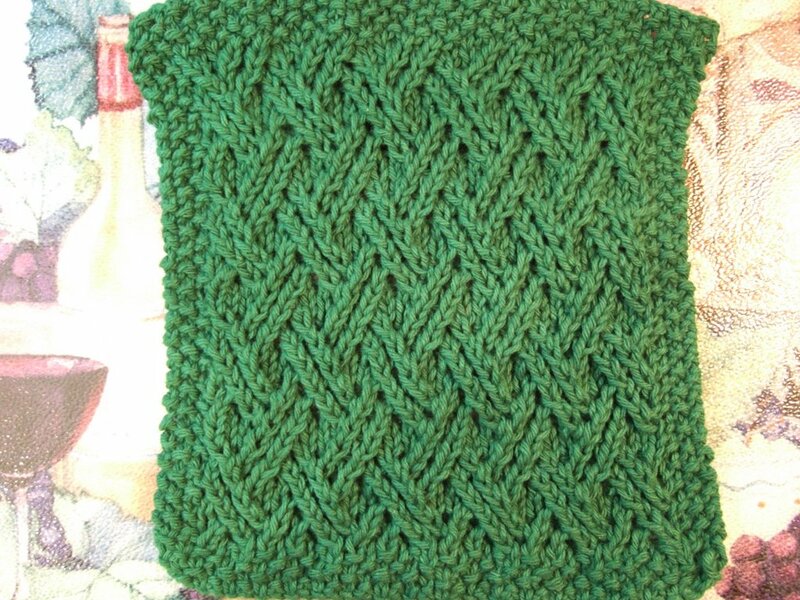 I've never tried knitting something to gauge before, so I'm wondering if it would be safe to just follow the instructions for the medium size vest and hope I get a small size in the end. 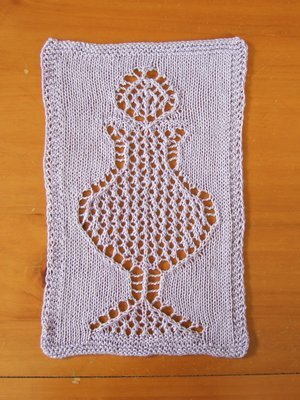 This is Elann's Sonata Print yarn in Lilac Medley, a DK weight mercerized cotton. 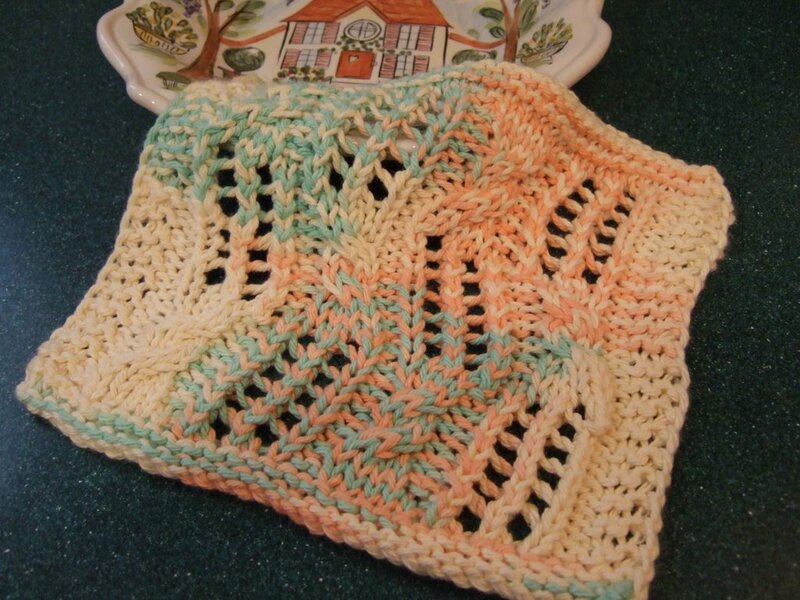 It's lighter than the usual P&C or S&C kitchen cotton yarn used for wash cloths. I love the purples in Lilac Medley, I'm a sucker for the purples. A lot of the other Sonata Solid & Sonata Print colors cry, "Buy me! Buy me!" I only bought a couple of balls to try out, before I decide whether I like it. 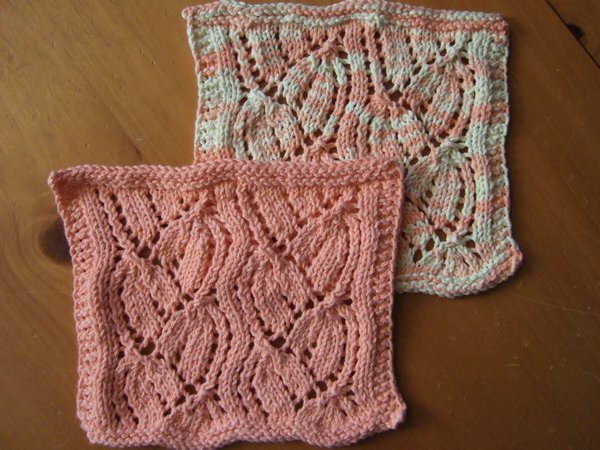 Although I have to admit that I have yet to run into an Elann house yarn I don't like. 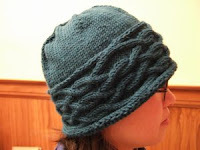 You'll find Sarah's Swiffer Mop Pattern here. 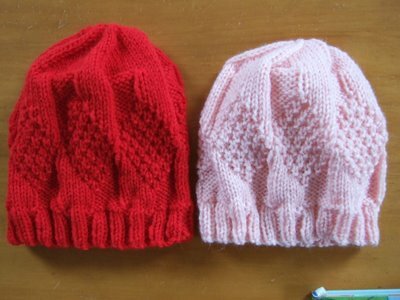 It's a quick & easy knit. If you find that her mop cover is a little too narrow for your mop, then you might try making the same modifications I made: After knitting the 2.5" of fold-up edge, increase by 4 stitches in the main section for the added width and then knit for about 10", then decrease back to 17 sts and finish off the last 2.5" of fold-up edge. Need more explicit info for the increase/decrease? 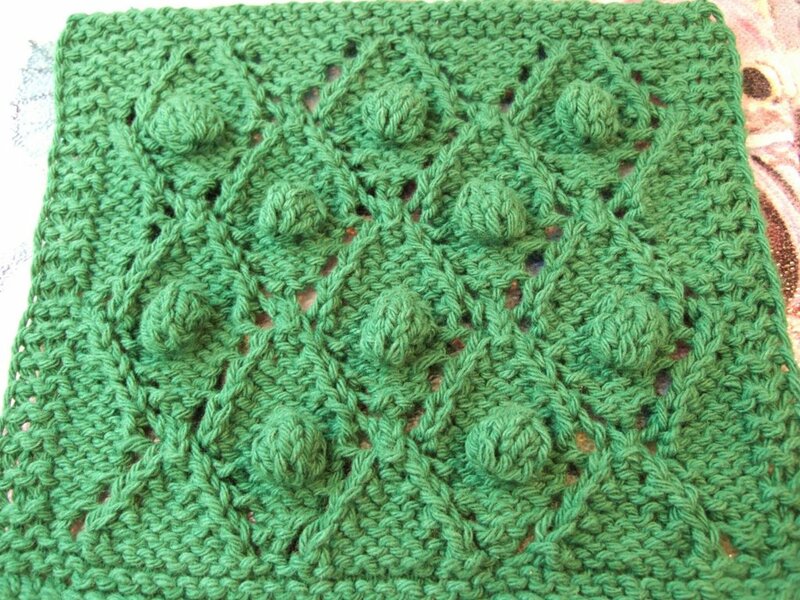 I tried to keep the seed stitch patterning in mine, but you can do yours any way you like. It's just a floor mop, nobody really cares! LOL. I slipped the first stitch of every row because I was under the impression that the chain selvedge would help me when I seamed the fold-up edges. I don't think it matters either way. 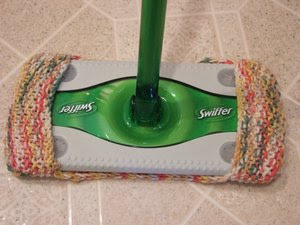 Note: On Aug 3, 2007, I made further modifications to this swiffer mop cover in an effort to get an even better fit. 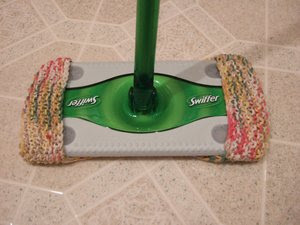 You can see my 2nd modified swiffer mop cover here. We've been busy going to our new house on the weekends in an attempt to get "stuff" done. Unfortunately, we get little done (or much less than we had planned), due to M's constant need for attention (plus trying to work around her nap/feeding schedule). I want to wipe down all the kitchen cabinet & linen closet shelves so I can start puting in shelf liner and moving stuff in. I've already moved a couple of boxes of stuff to the new house. I want to empty the boxes so I can take them home and refill them again. The moths are just a minor annoyance. 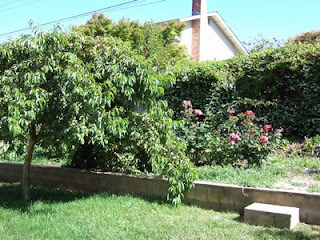 The major annoyance are the gazillion of wasps outside our back yarn (they don't seem to like the front yard as much). M really wants to go outside, but we don't let her cuz she is oblivious to the wasps and I don't want her walking right into them. The wasps tend to hover just above the grass. 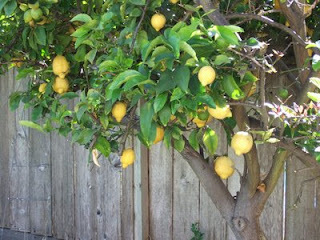 I wonder if there is something about all the fruit trees and rose bushes which attract the wasps. I don't see any obvious place the wasps are coming from, no visible nest from what we can tell. 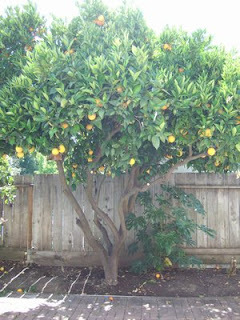 Here's our Peach tree. 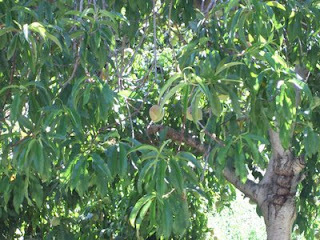 The previous owner let the branches grow and grow and grow, so the peaches weigh down the branches which now touch the ground. 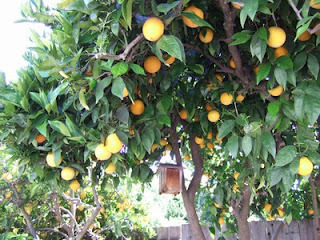 And to the right of the Lemon Tree is our Orange Tree. I think that might be a bird feeder in the 2nd photo? 1. Get window treatments in the queue. The Blinds Window Measurer came by on Friday 6/22. He only had to measure the windows where the blinds will be installed (viz. 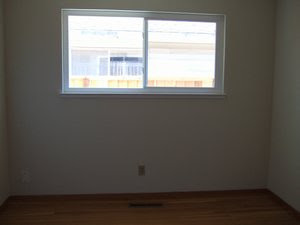 bedrooms, kitchen, & bathrooms), but he also measured the living room & dining room windows where the shutters will go. The Shutters Window Measurer (a different guy) was supposed to come by on Friday, but he was too busy and couldn't make it. We still have to reschedule that appt. 2. Get carpets in the queue. We have chosen a light whitish colored berber carpet for the 4 bedrooms. We'll probably get a call from the Carpet Measurer early next week. 3. Purchased an electric stove and hood. I do like how the knobs are in the back where M can't reach them. And one selling point (for me) was the cooktop/oven lock. Yes, it is stainless steel. DH insisted that we get stainless steel appliances. He wants a stainless steel fridge too. We've decided on the window treatments for our new house. Faux wood shutters (like these), 2 1/2 inch, for the living room and dining room; both rooms face the street. Faux wood horizontal blinds (like these), 2 inch, for the bedrooms, bathrooms & kitchen. Vertical blinds for the sliding door in the family room. I can't remember the color of the shutters, but I think the color we chose was called Honey Maple. And I think the color of the blinds was called English Oak. The blinds will take a couple weeks to arrive. The shutters take 6 to 8 weeks. Eeks. I think we'll have to put up something temporary while we wait cuz we are not waiting for the shutters to get installed before moving in, that's just way too long. Besides, DH is aiming for moving in during the week of July 4th because his company has a mandatory week off. DH wants the shutters to be some brown wood color. I've been looking at the window treatments in all the houses I drive past. Of all the the houses with shutters, they are always a white or whitish color. No brown shutters. I wonder why they are unpopular. I like the look of the white shutters. I'm guessing DH thinks that dust is more noticeable on white shutters? Or perhaps he wants to add some color or warmth to our stark white walls. The previous owners slapped on white paint prior to putting the house on the market, and it is a very bland white without any warm tones. 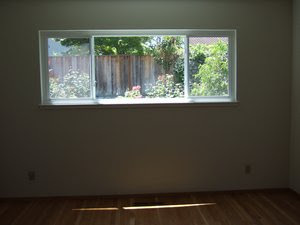 I also paid attention to the type of blinds people have in their windows, they also tend to be some white/whitish color. Very few brown blinds to be found in houses in my area. So I wonder whether brown is not such a good choice. The window measurer is coming to the house tomorrow to measure all the windows. We have the termite people coming in next Wednesday to do most of the stuff that were mentioned in the Pest Report. We've started to move some stuff over to the house. You know, the stuff you think you can do without. Well Mom asked for some lemon tea, and as I was rummaging around for it, I realized I had already moved it to the new house. Most of my tea collection moved last weekend. 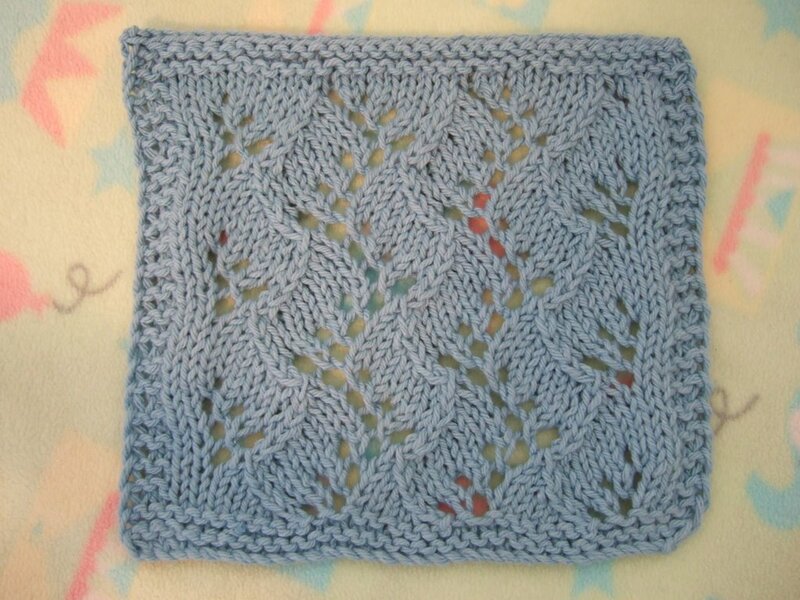 I started a baby blanket for Jack back in December 2005. April 2006 rolled around, blanket still unfinished. 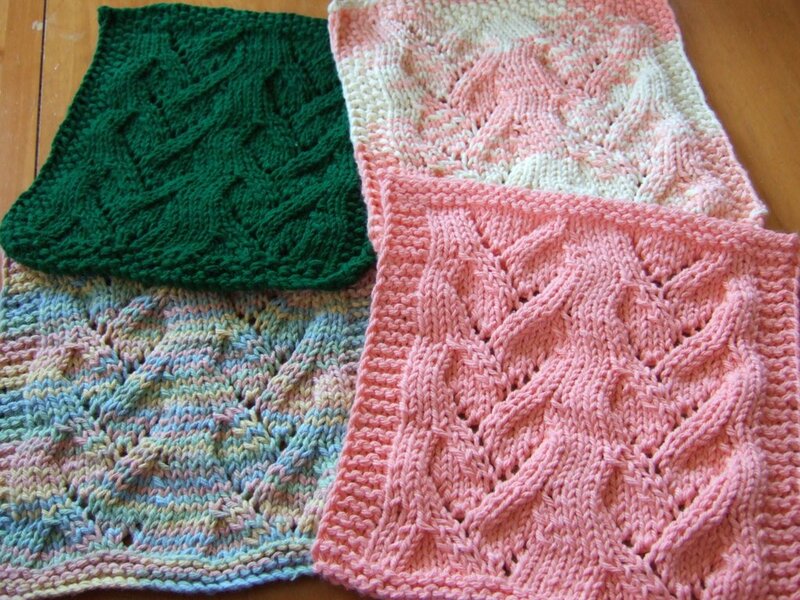 Two other babies have entered the world since then, blanket still unfinished. Now we have friends who are expecting their first baby in August. Do you think I'll be able to finish this blanket before then? I would actually need to finish it by July 22. 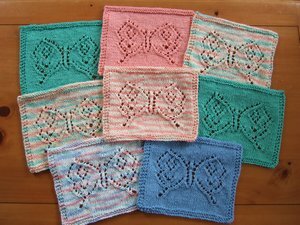 The photo above shows how much I have finished so far, plus 4 rows I recently knitted ... about 45" wide and 15" high (114 cm x 38 cm). 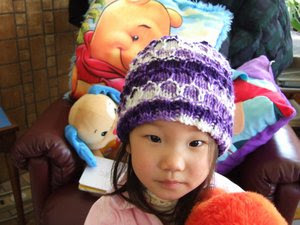 Today, I discovered that Libby is having a Knitting Olympics warm up. Take an old WIP and finish it in 17 days. Sounds like a great motivator. 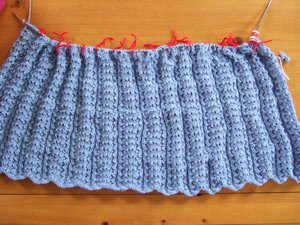 So my goal now is to try to finish this blanket by July 6. Better get to it cuz it takes me about 15 to 20 minutes to work each (220 stitch) row. You saw this hat a while back in May, you can see the top of the hat here, and close ups of the grey & white/beige hats here. I was looking at the files on the computer, saw Utopia.doc word document and thought oh goodie, I already typed up the pattern. Nope, no such luck. I opened the Word doc and it was empty. I also got this enable/disable macro popup window which would always pop up whenever I opened the Word document or just launched Word. It's probably a side effect of launching Word for the very first time on my "new" laptop. Anyhowz, that problem disappeared on its own. 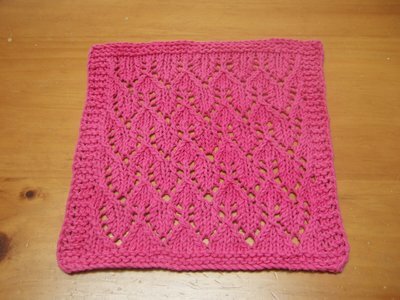 So I finally got around to typing up the pattern. 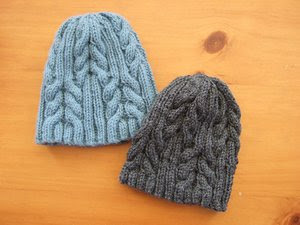 These hats are for Cap Karma. 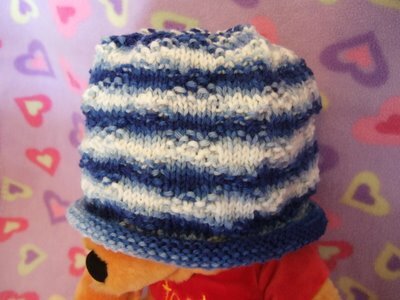 I did try to take photos of the blue hat while M was wearing it, but they all came out blurry! Hard to capture someone who doesn't understand the concept of being still long enough for my camera to auto-focus and take a picture. 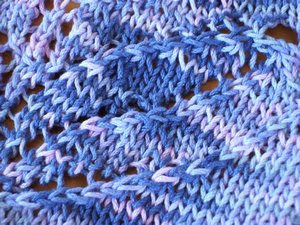 You can knit as much ribbing as you like before starting the pattern. 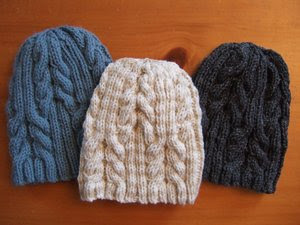 I think I knit 4 rows of ribbing in the grey hat, and 5 rows of ribbing in the blue hat. 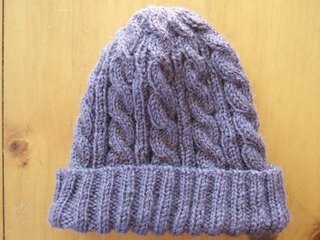 I don't think a fold-up brim would work very well for this hat as it would cover up much of the cable pattern on the bottom half of the hat. 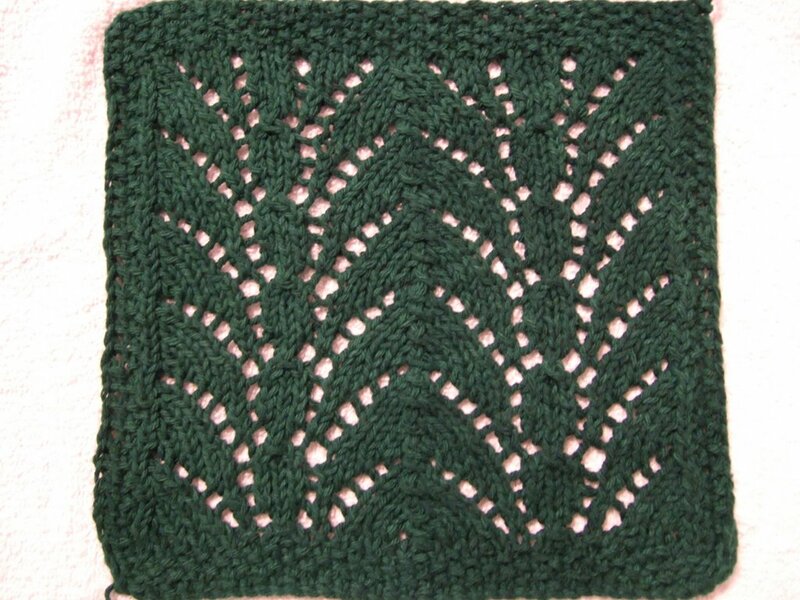 The pattern is pretty easy to memorize once you've done the first 6 rows of the pattern, then it becomes mindless knitting. 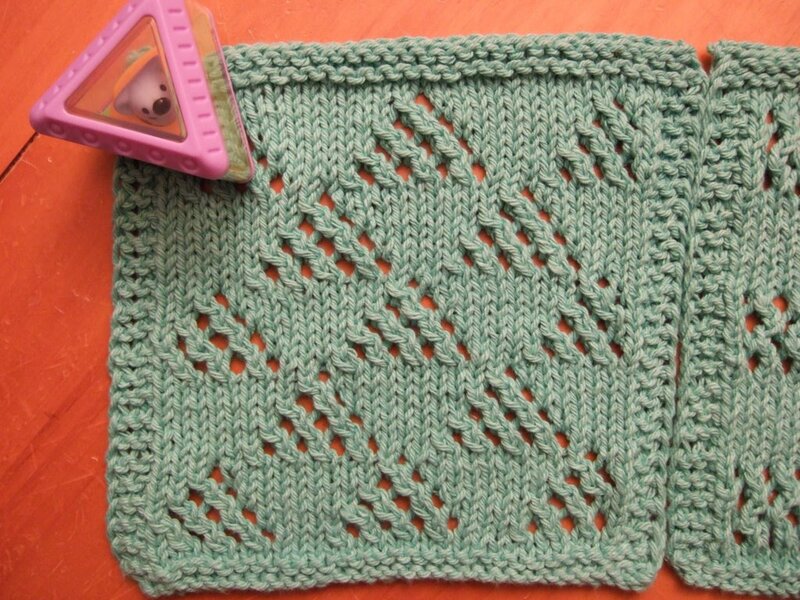 Great pattern to knit while watching TV. 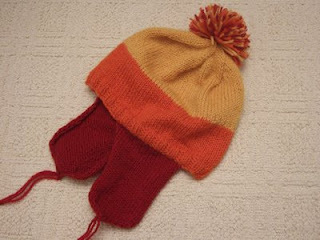 There are two different decreases for this hat. 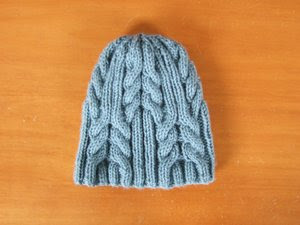 There is the "plain" decrease which you see in the blue hat. 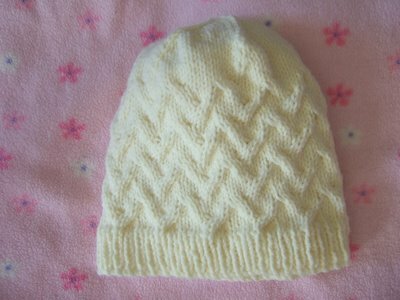 And there's the "twisted" version which you see in the white/beige hat, where there is an extra cable twist at the top. 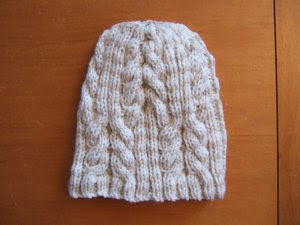 You can see more photos of the grey hat and white/beige hat here. 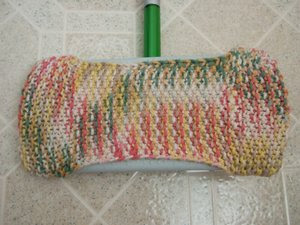 Well, M noticed the new cover when she passed the mop, guess the colors caught her eye. We both enjoyed mopping with my new Swiffer Mop Cover (yes, she "helps") and it really picks up dust!!! I had mentioned how the cover was a bit too narrow to cover my mop head surface. Well, here's a photo of how it fits after the cover went through the wash once. It's a smidgen more narrow. 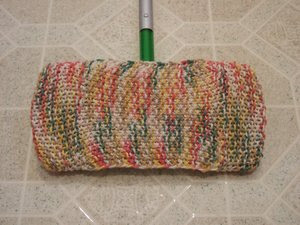 I definitely need to knit my mop covers wider for them to fit my mop. These mops probably don't come in a "standard" size (just like regular sponge mops have to real standard size), so I understand it's hard to get an exact fit. Plus we all knit with different tension. 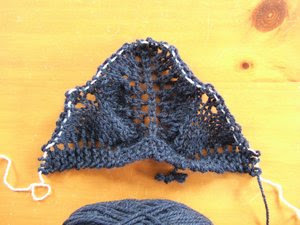 I am going to try knitting a wider cloth. 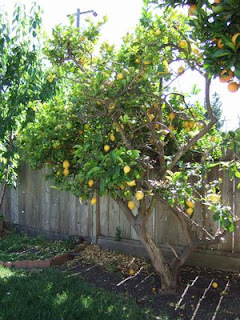 I thought we'd get more time to relax after escrow closed. Ha! Boy was I wrong. Now we're so busy trying to get everything that needs to be done before we move in. We're spending time going to the house (an hour's drive away) and researching things we need to purchase (window treatments, carpets, appliances, etc). We're thinking of shutters for the living room & dining room. Wood or faux wood horizontal blinds for the bedrooms. Faux wood horizontal blinds for the kitchen & bath, cuz real wood isn't such a good choice for high humidity areas. And vertical blinds for the sliding door in the family room. We need to get a fridge. I do not want one with a beverage dispenser on the outside; most of these models have side-by-side fridge/freezer doors. It looks like the french door fridge with bottom freezer styles are popular because I didn't see many of the top freezer/bottom fridge models. 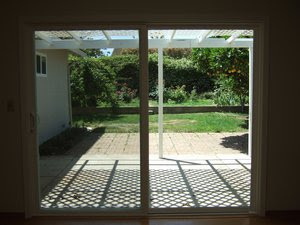 We'll probably go with one of these french door models... just need to decide on two things... 22 cu ft or 25 cu ft? ... white or stainless steel? 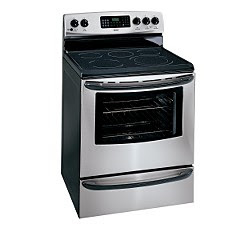 I was under the impression that stainless steel appliances were going out of style, but I really do like the look. So if we go with stainless steel, I'd like it on both the fridge and the stove so that they don't look mismatched in the kitchen. We did accomplish quite a bit today, given that we had M with us. I managed to put drawer liners in 2 drawers. 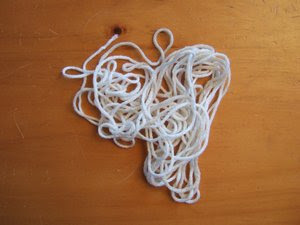 I tried out the washer & dryer for the first time by doing a load of whites. The dryer doesn't vent to the exterior. The previous owners have this box doohickey that is supposed to help catch lint or something ... you fill it with water and the hose attaches to it. We will definitely need to find someone to run that hose to the outside; the downside is that the dryer isn't adjacent to an exterior wall, so it would have to run along a wall until it reaches the part of the wall where you can punch a little hole in it. We managed to get some lunch at MyungDong Tofu Cabin for their Dol Sot Bi Bim Bap, then stopped by Home Depot to check out window coverings, carpeting, and appliances. I was so amazed that we were able to check out 3 depts in one visit. M definitely does better after lunch than before lunch. We did a before-lunch trip to Lowes last weekend and it didn't go well. Besides house things, I've been busy getting my new computer configured. It's an IBM Thinkpad T60 which is sooooo much lighter than my previous computer. I had used an IBM Thinkpad 600E before and had forgotten how nice their keyboards are. This laptop is so much lighter than the Sony Vaio PCG-GRV680, however it has a smaller LCD. It is a refreshing change to be able to lift a laptop with one hand. :-) I no longer have to listen to the Sony's loud fan, and I don't have to deal with that power problem I had where it would frequently drop to battery power. But this IBM does have its quirks. Sometimes there's no mouse (and keyboard) control after rebooting or waking up. I finally have a computer with USB2 ... there is a whole world of difference between USB2 and USB1. I noticed it when I punted files from my old laptop to an external HD (which took all day) and then punted the same files from the external HD to the new laptop (which took minutes). Probably not the most efficient way to punt files, but I like to periodically backup my files to the external HD. Yes, we have a DVD burner. No, I can't futz with it to burn all my data to DVD. I thought I'd reinstall The Sims -- not that I would ever find the time to play it in the near future -- but discovered that my CDs are "buried". If you asked me where my Sims CDs were a few months ago, I could have told you exactly which storage box it was in. That was before our water heater leak which required me to move all our storage boxes to other rooms. The boxes are all jumbled up, and the 2 boxes of computer software are "buried" somewhere in the back. So busy lately, I haven't been very good keeping up with bill payments. And today was the first time I forgot to return books to the library which were due today. Oops. 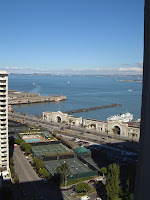 I'm going to miss the San Francisco Public Library after we move; they have a pretty good collection of books and DVDs. Dragostea Din Tea is a really catchy tune (YouTube video & link below). I also have the other version by Haiducii and I like them both. I like the way Romanian sounds, but again, like most other non-English music, I have no clue what is being sung. But we can still enjoy music without understanding it, right? Francis Cabrel is one of my all time favorite French singers. I have 14 of his albums, but haven't gotten around to ripping them all. I'm afraid my storage boxes of CDs will become more "lost" after we move to our new house. 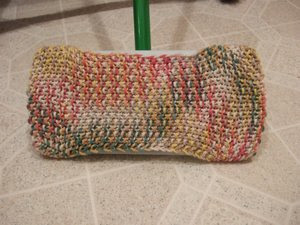 I've finished my very first swiffer mop cover! 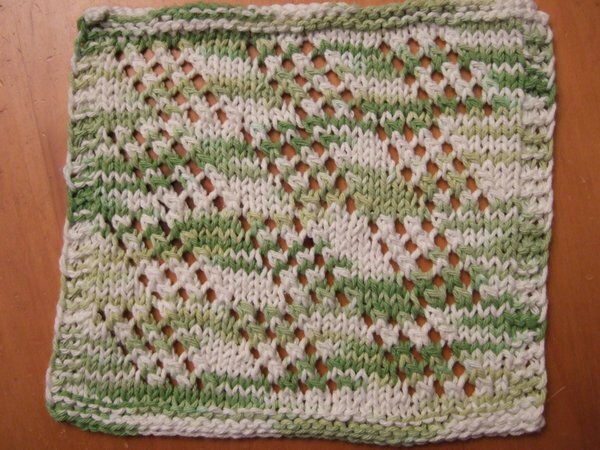 Neat how my rectangular strip of cotton turned into this. It looks great from the top side. I was worried about it fitting, but the ends just stretch on and are pretty snug. It definitely looks better -- and more colourful! -- than the swiffer disposables. I think the length is great, but I need a little extra cover width-wize; you can see part of the mop exposed. Perhaps my mop is just slightly wider than some others ... I can't imagine all these mops being the exact same size. 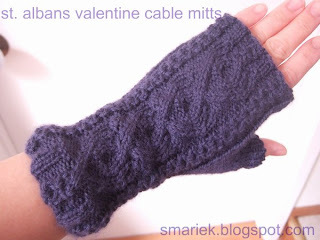 And of course it could also be the way I knit. So how many of these swiffer covers does the average person need? How often does the average person swiffer? 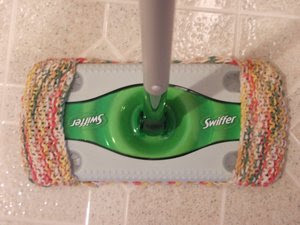 And do you wash your swiffer covers with your regular wash? I love how my swiffer mop no longer looks as naked as it used to. I think I'll have to keep a cover on my mop even while it is not being used. 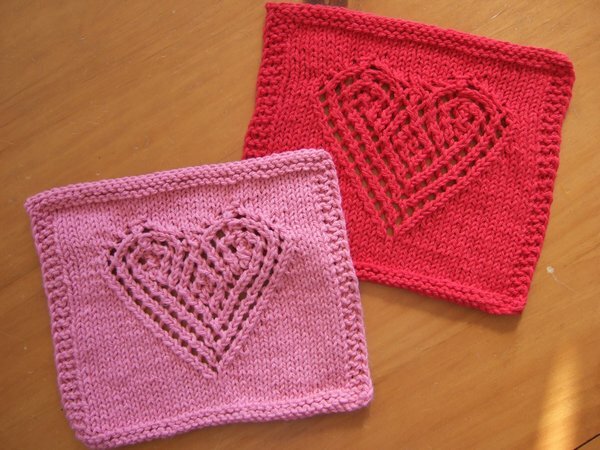 You'll find this pattern here, and a crochet version here. 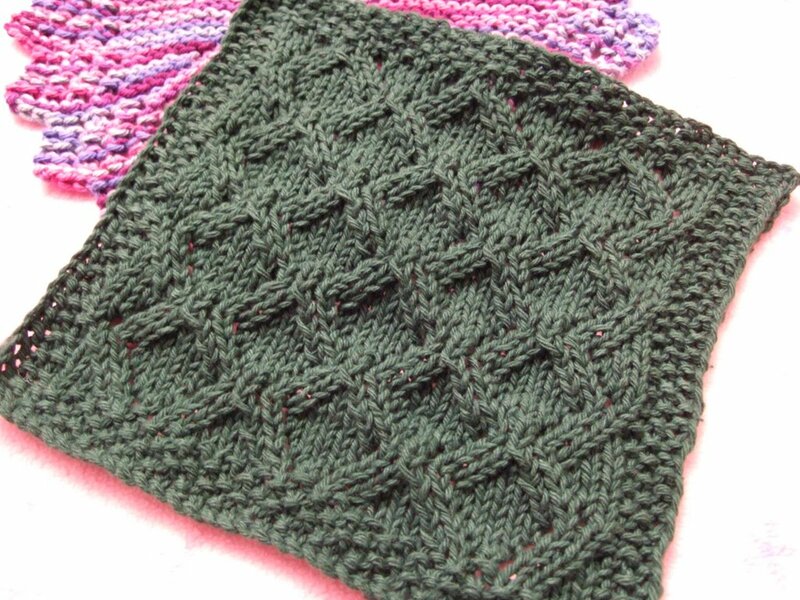 The pattern is great for mindless knitting, and I love how the rows are only 17 sts across which makes it easy for me to pick up/put down quickly as I try to squeeze in a few rows now and then. 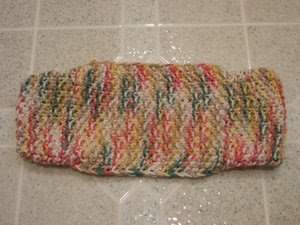 I can knit this cloth easily in a week; the cloth can easily be knitted in a day or two for the average person. 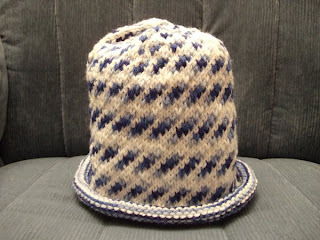 It's my Utopia Hat. 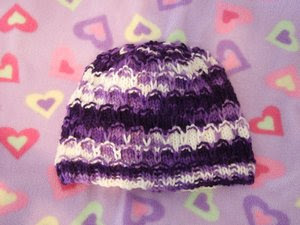 Typing up the pattern is on my "todo" list, I just haven't had time with all the house things. This grey one has the same "plain" decrease as the blue one. 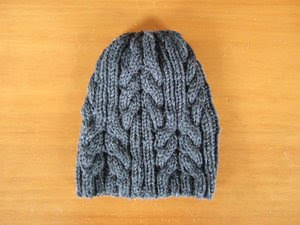 This white/beige hat has a "twisted" decrease, you can see the difference when you compare the top of this hat to the top of the blue or grey hat. I haven't decided which one I like best. 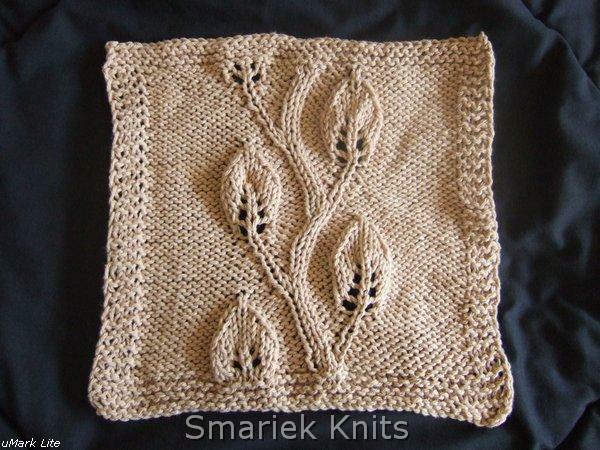 I was pleasantly surprised by this white/beige variegated yarn. The cables actually show well! 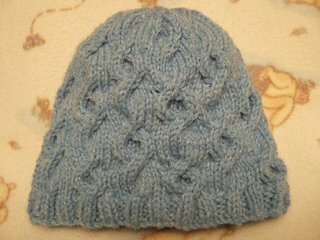 I was afraid it would turn out to be a flop like all the other cable hats I made with that blue/white variegated yarn that I had so much of. All these hats are going to Cap Karma as chemo caps. Well, that's all for now. 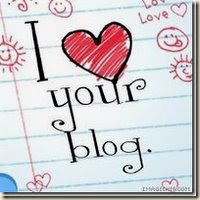 I have lots to say but no time to organize my thoughts or photos. 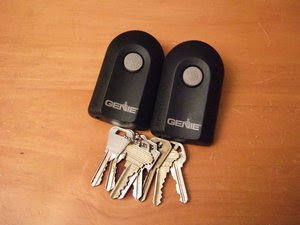 I thought I'd be relieved after getting the keys to the house, but I find we're just as busy trying to figure out what we need to get done before we can move in. We spent the weekend driving over to the new house and doing a bit of shopping/research. It's so tiring to drive an hour to get there, and also try to work around M's feeding & nap schedule. And we get very little done while we're in the new house due to M's constant need for attention. We managed to get utilities going. Next thing on the list is to tackle some of the "must do" things on the Termite Report. The big one is the soil treatment for subterranean termites. We also want to look into getting all the electrical outlets grounded cuz they're currently the old 2-prong types. And it looks like the water heater needs replacement. Still deciding on window treatments. Maybe wood blinds, or a combination of shutters & blinds. Still need to decide where to use vertical blinds and where to use horizontal blinds. I think I've found a possible dining room table at Ikea. We'll see. Need to shop around a bit more. Haven't had much free time. We spent the weekend driving down to the new house to do "stuff", but not getting as much "stuff" as we had planned. It's hard to get "stuff" done while M needs constant attention. But we have managed to start a list of things we must do before moving in, measuring the windows, taking photos, and getting a few misc house things (broom, etc). First thing we do Monday morning is call to get our utilities established. We need to get something on our windows soon. Our house looks so naked from the outside. We're leaning towards 2.5 inch wood (or faux wood) slat blinds or shutters. I like the shutters, but V pointed out that opening them might bump into furniture and limit how we can arrange furniture near the shutters. Now the next question is .... vertical blinds or horizontal blinds? 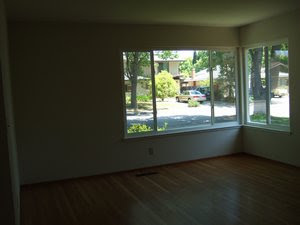 And do the front facing living room blinds have to match the front facing dining room blinds? Definitely vertical blinds for the sliding door in the family room. That's the back yard where you'll find lots of things flying low to the ground just above the grass. I think they look like wasps!!! Need to figure out what to do about that cuz I can't have M walking/running around out there with the risk of being stung. Oh, we tried out the sprinkler system. Never had one of those before. The water attracted a bunch of neighborhood crows who seemed to enjoy being near the water. I had the wonderful opportunity to meet Barbara and Lisa on Thursday when they were in town. This was the first time I had ever met any of the Elannites. 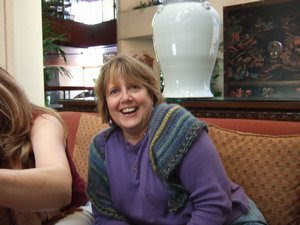 I was meeting Barbara in the lobby of the Hyatt on Union Square. 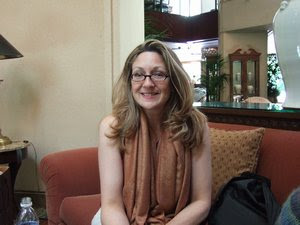 She told me what she would be wearing when we spoke on the phone earlier in the morning, but I was so scatterbrained that I could not remember what color that was. 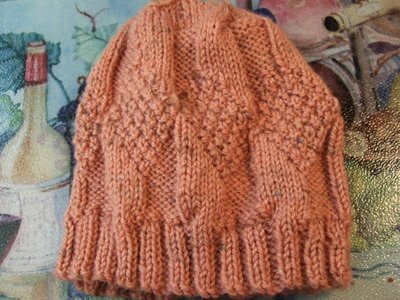 However I just had a feeling that I would be looking for somebody with knitting needles... and I was right! There was Barbara, sitting in an armchair knitting a sock. This is Barbara, wearing a shawl she designed. 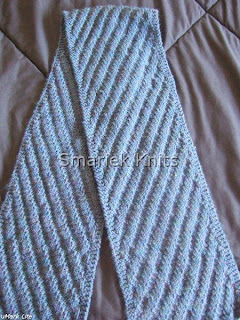 I should have taken a photo of the back, it is made of this beautiful variegated yarn (Lang?). 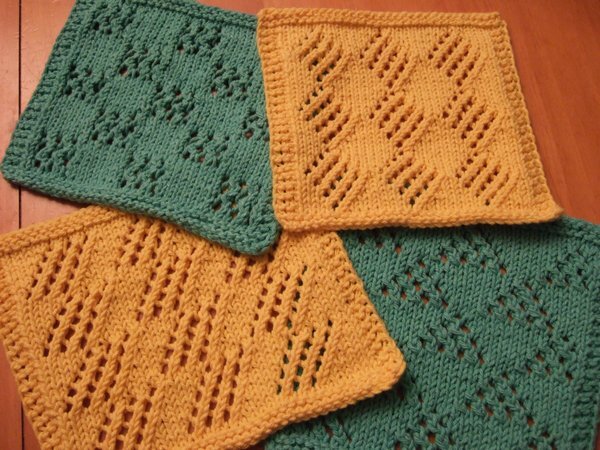 I hope she posts the pattern for this shawl (hint hint hint). Lisa met us in the lobby shortly after I arrived. She sold me on the KPO needle set. I had seen it on the website but didn't quite get how it worked. She showed me how easy it was to put together. Omigosh, what a clever design! The connector thingamabob is ingenious, the cable was surprisingly flexible (more so than the Addis! ), the tips are sharp, and it all comes in a great compact binder. I want! I want! I want!!!! Lisa is a busy girl back home in Alaska. Despite being in a rural area, she delivers quite a lot of babies. I was also surprised when she told me she only had 4 yarn stores within a 60 mile radius. Oh, and this is me and Marisa. We walked over to ArtFibers, just a few blocks away from the hotel. You can easily miss the store if you blink. But once you find the stairway leading up to the shop, omigosh, you are in a knitter's candy shop! Love how yarns are organized, and how they have swatches of the each color and yarn. There's also a comfy corner where you can play with some of the yarn and knit up swatches before deciding on what you want. 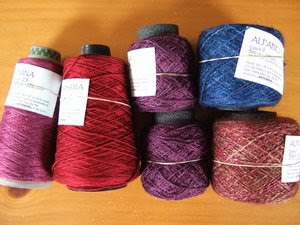 Barbara & Lisa had visited Artfibers the day before and I got to see their yarn haul. Beautiful stuff, I'm sure you'll see it on their blogs. Lisa entertained M while I drooled over, er, I mean shopped for yarn. 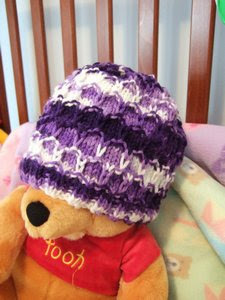 Barbara helped me choose colors & yarn. M enjoyed playing with Lisa while I shopped, and really attached herself to Lisa. M is very picky about who gets to hold her hand (she often tells DH, "NO!" when he asks for her hand), but she wanted Lisa's hand when we walked back towards the hotel after shopping. Living in San Francisco for most of my lifetime, you'd be surprised to hear that I had never stepped foot into this store before. 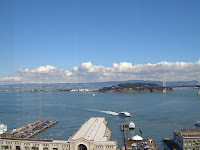 And I even used to work downtown in Embarcadero Center (and had a great view, see photos below), about a 10 minute walk away. 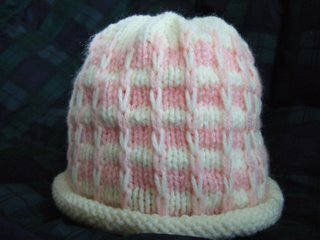 I only started knitting in November 2004. This was 2 months after I quit my job, so I was no longer going downtown every day. 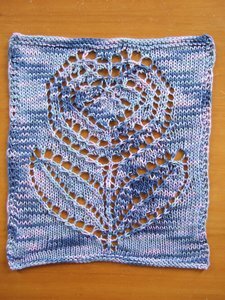 Then after doing some web searches for knitting stuff, I stumbled upon the Knitting About.com forums where I learned about Elann. 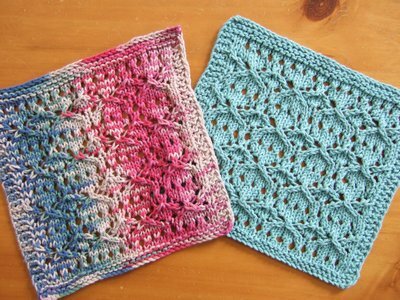 I placed my very first order from Elann in December 2004, some Filatura di Crosa 501 for my first baby blanket which I knitted during a trip to Carmel in January 2005. I've pretty much been ordering 99% of my yarn online since then. It's just so much easier to shop online, especially since M arrived. 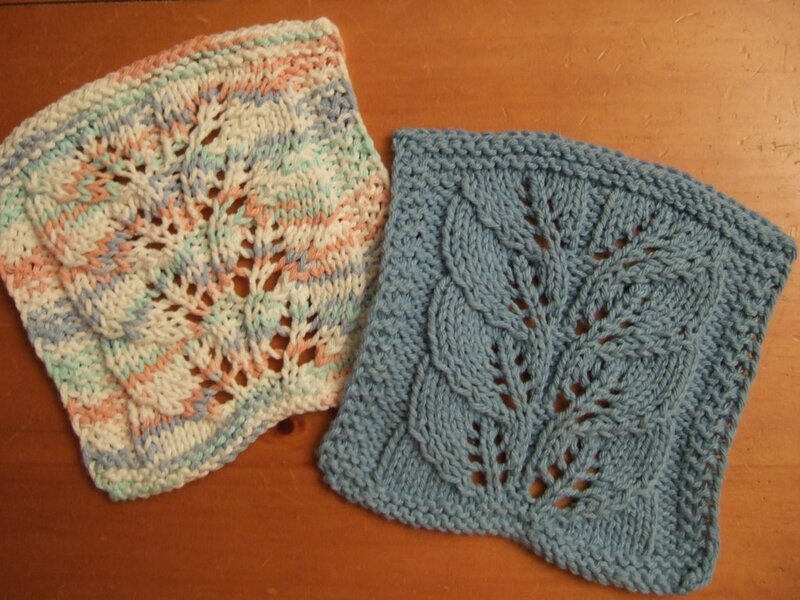 Vicki told me about Artfibers a while back when she visited the store once, but I can't remember whether I was still pregnant then or whether it was after M was born. I loved their Hana 100% Silk yarn, 26 stiches x 34 rows =4"/10cm on US #3 needles; I got 224 yds of color 12 (the 2 small balls of purple) and 537 yds of color 23 (the rosy cone on the left). It wasn't until much later (now) when I realized that the suggested needle size is US3 (3.25mm) needles -- not that this is a problem when I have 11 circular needles of that size, but... Eeks! 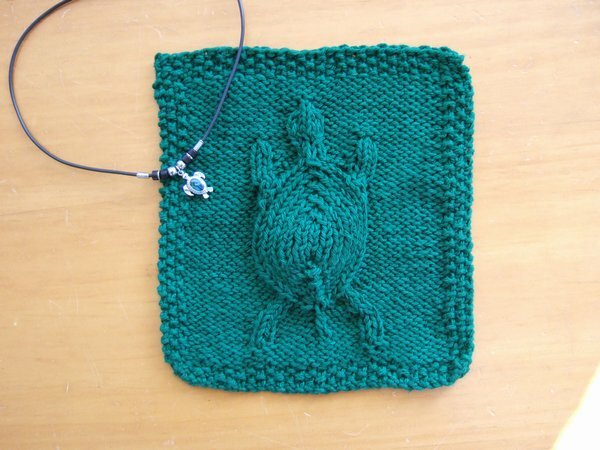 I've never knitted with anything that small before!!! 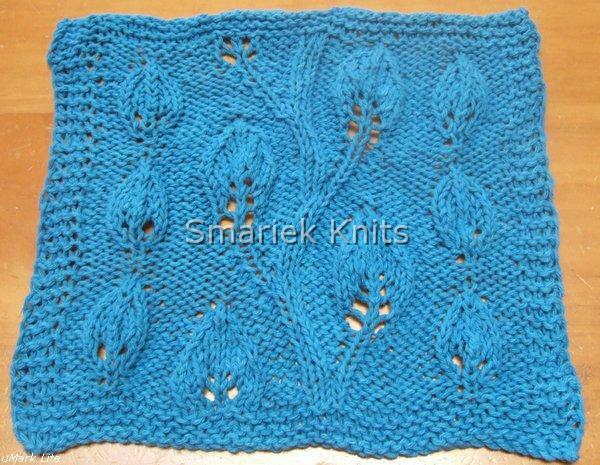 Another one I was drawn to was Alfabeto 76% silk 19% superkid mohair 5% wool yarn, 22 stiches x 29 rows =4"/10cm on US #6 needles. Those are the two balls on the right, 500 yds each. The blue is color 11 and the pink is color 1. I think Barbara also got some Alfabeto in color 1. I'm so glad they had swatches at the store because I was lukewarm to color 1 from the cones; it was the swatch that sold it. 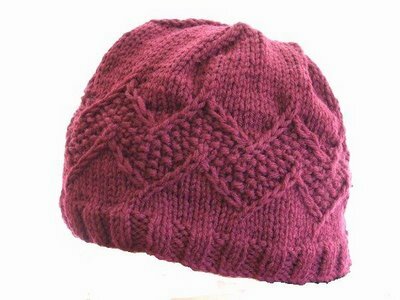 My favorite is the red cone which is their Kurasawa silk 50% extrafine merino wool 50% yarn, 20 stiches x 26 rows =4"/10cm on US #7 needles. I have 678 yds of color 4. 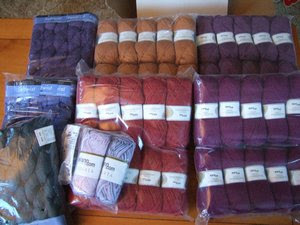 Besides my Artfibers haul, I also placed an Elann order earlier in the morning. More Highland Wool (for Mom's vest and possibly some shawls) and Berocco Softwist. I had never seen or felt the Softwist before, but decided that the Berocco yarns can't be all bad after a pleasant surprise working with Berocco Air (another yarn I bought sight unseen). Of course there's always the chance & fear of opening my little white box and discovering that I hate hate hate that Softwist yarn... then would I do with 30 balls of the stuff??? 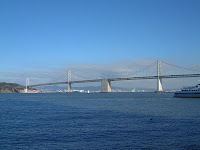 Here are some photos of San Francisco which were taken in 2000. 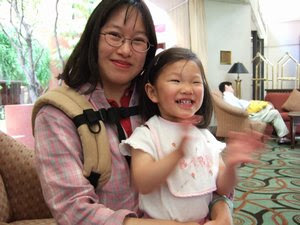 You can click on the photo to see a larger version. Here's another view from the office. Yes, it can be distracting at times. ;-) Would you believe that there were times when it was soooooo foggy that all you would see is white? 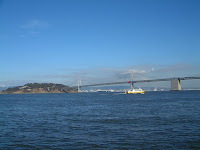 Just more views from this corner of San Francisco... the Bay Bridge and Treasure Island. 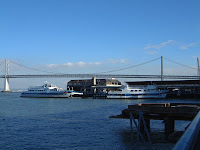 The Ferry Terminal, adjacent to the Ferry Building. 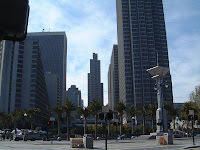 These are the Embarcadero Center buildings, with the Hyatt Regency Hotel on the left. 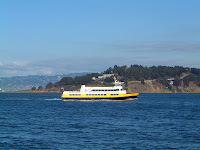 This is one of MUNI's light rail vehicles. Photo taken on a foggy overcast day on West Portal Street ... not exactly a "touristy" part of town, so I wouldn't be surprised if you had never heard of it. 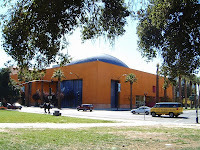 This is the Tech Museum in San Jose, CA.